Carrying a Bale Up Hayfeeder, weighing around 470 kg they are easy to cart (this one was carried 10km) with standard length forks, no need for long prongs. Here we have two 6 foot round bales in one of our feeders, try that in any other hayfeeder, as you can see the ground is quite wet but the bales are high and dry, hay sitting on the floor is eaten just as readily as that in the cradle. Easily able to hold a big square bale this guy had only borrowed the feeders from his mate but tells him that " they are not coming back, I will have to buy you some more", "these are the best feeders I have ever used" he does not replace the bale until they have eaten the lot and has only had to tip one feeder over for cleaning after putting a "garbage" bale in it. Same feeder different angle, this feeder is in a paddock of dry cows. 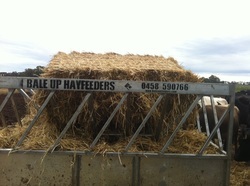 Bale Up Hayfeeders, large size on the left, smaller calf size on the right, the large size is close to 11 feet long, 8 feet wide and 5 and a half feet high (3.3m x 2.45m x 1.75m),This feeder is capable of easily holding an 8x4x4 big bale or 2 x 5 foot round bales. 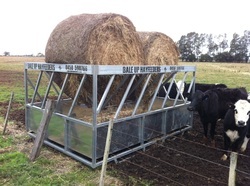 The smaller feeder is for calves and is close to 11 feet long 6 feet wide and 4 and a half feet high with a Vee in the floor to keep any dropped hay in reach of calves. 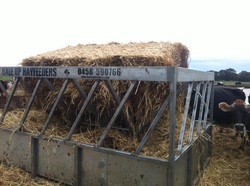 Calf feeder at Colin and Michelle Goddens dairy farm Nanneela Vic, easily strong enough for 2 bales. 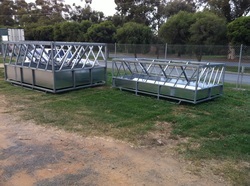 Our new Multifeeders, will feed, cows, bulls, yearlings. After many requests for this type of feeder we are now manufacturing, like all our feeders we include a floor to keep hay where it should be, off the ground! 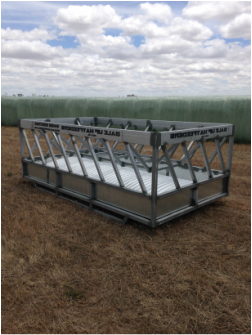 *able to be carried full, reinforced floor allows you to move paddock to paddock with hay in it. 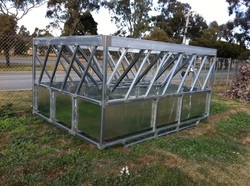 Sorry I couldn't match my main competitors price but another $400 bucks plus gst buys you a bigger stronger feeder which is made in Australia, not flat packed from China and assembled here, while not as efficient as our full size feeder (because of the width) this this feeder will perform much better than any old style ring or loop feeder. 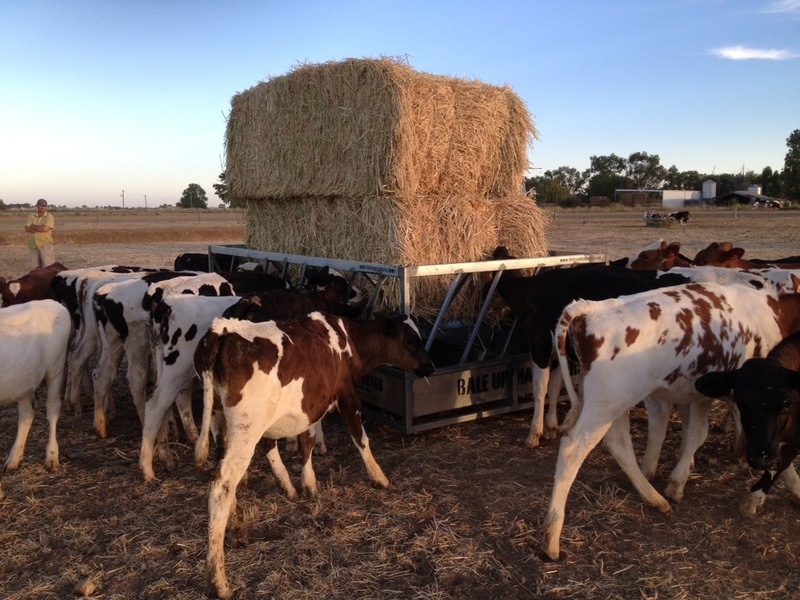 This is our calf feeder model, has the rolled corrigated floor to force hay to the edge, this feeder is 3.3m long and 1.8 metres wide and can easily hold big square bales.